Sundays — Sat evening: 4 p.m., 6 p.m. (Spanish); Sun: 8 a.m. (Spanish), 10:30 a.m.
22nd day of each month, unless the date falls on Saturday — 8:45 a.m.–4:45 p.m. 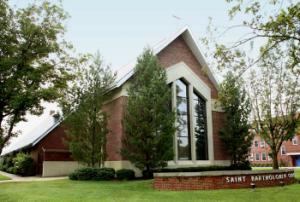 In August 1941, Archbishop John A. Floersh approved the establishment of a new parish in southeastern Jefferson County. Father Bartholomew Beruatto was the first pastor. The first Mass, celebrated at St. Francis of Assisi on Sunday, September 14, 1941, marked the beginning of St. Bartholomew Parish. On September 28, the newly formed congregation of hard-working farmers met to celebrate their first weekly Mass in the American Legion meeting room over the Buechel Bank. The first building endeavor was to establish a rectory. Soon Masses were celebrated weekly in the basement of the rectory. In 1942 construction began on the church and school. On October 11, 1942, the congregation celebrated the first Mass in their newly built structure. The Ursuline Sisters of Mount St. Joseph were invited to share in the formation responsibilities of St. Bartholomew. With the growth of population after World War II and the arrival of General Electric in 1951, church membership soared. Construction of a new church was undertaken in 1959. In just seventeen years, St. Bartholomew had grown to require a worship space that could accommodate 1,000. In 1997-1998, this worship space was again renovated. Today the parish has 1,350 parishioners. Many priests, deacons, religious sisters, teachers, lay ministers, and especially parishioners have left their mark on the history of St. Bartholomew Church. Guided by the power of the Holy Spirit, their motivation has been to love God with all their heart and all their strength and to love their neighbor as themselves.